Can you be a brain without the pain? How many scientists does it take to change a light bulb? ALUMNI | As a research facility at one of America’s top hospitals buzzes with activity, two men chat in a narrow, unassuming office. One is jaunty, with a smile as his default facial expression and a melodic lilt to his voice. The other is more reserved and speaks with a softer, deeper tone. They haven’t seen each other in about a year and a half, but once they’ve shaken hands, their conversation immediately turns to science. When your work has the potential to save millions of lives, that’s what you do. Rakesh K. Jain, COE74M, 76PhD, has spent decades working on some of the world’s most pressing health problems, and has come to be regarded as one of America’s most accomplished scientists. Arup K. Chakraborty, COE88PhD, is tackling one of the world’s most elusive challenges: creating a vaccine for the human immunodeficiency virus (HIV), the causative agent of AIDS. Both professors are where they are today partly thanks to the school that helped set their scholarly paths: the University of Delaware. Jain, who is the Andrew Werk Cook Professor of Tumor Biology at Harvard Medical School, is responsible for a game-changing paradigm in cancer treatment: By normalizing the function of blood vessels in tumors, he discovered, one can treat the tumors more effectively. In 2014, this principle led to the approval of the first medical treatment for patients who lose their hearing from a benign tumor, known as schwannoma-UK. This principle has the potential to improve treatment of more than 70 different diseases that afflict half a billion people around the world. As director of the nearby Institute for Medical Engineering and Science at the Massachusetts Institute of Technology, Chakraborty is the Robert T. Haslam Professor of Chemical Engineering, Physics and Chemistry. He spends his days targeting another deadly disease: HIV. He is attempting to manipulate adaptive immunity—part of the immune system that targets and destroys harmful germs in a pathogen-specific way—to create a vaccine that prevents infection from the deadly virus. Their work has garnered significant acclaim from the scientific world. Last October, Chakraborty joined Jain as one of just 21 people in America who have been elected to the three National Academies in the country—the National Academy of Science (NAS), National Academy of Engineering (NAE) and National Academy of Medicine (NAM)—that bring together the nation’s foremost experts in a brain trust. Last December, Jain was elected to the National Academy of Inventors (NAI), making him one of only 14 people in America to belong to all four organizations. And, in May 2016, he received the 2013 National Medal of Science at a White House ceremony. These men have more than success in common. Their paths have also been studded with a few of the same milestones. Both earned their undergraduate degrees at the Indian Institute of Technology Kanpur. 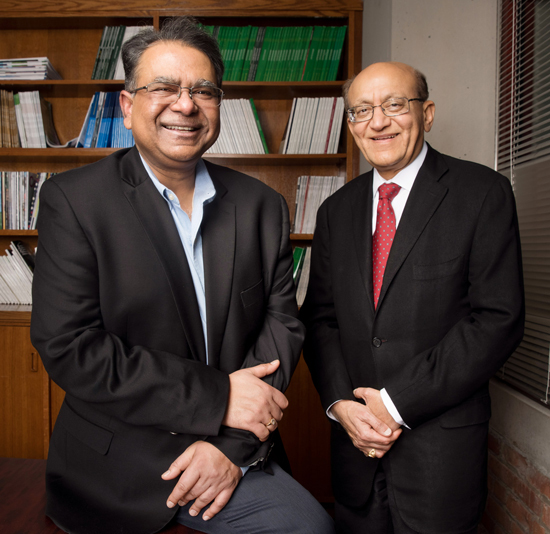 Both earned their doctoral degrees in chemical engineering at UD, where they tackled and completed thesis projects that defied the norms of their eras. Both teach and conduct biomedical research in Boston, at two of the world’s finest universities. Both also set the stage for their success at UD. Jain’s passion for education may have been predestined. A century ago, his grandfather started a school near his hometown in India. As an undergraduate chemical engineering student at the Indian Institute of Technology Kanpur, Jain read three textbooks by Mort Denn, then a chemical engineering professor at UD. He was so intrigued that he came to Newark in 1972. Outside the classroom, Jain learned about American life. He had come to UD with no cooking skills, but during his first year, he checked cookbooks out of the library and devoured them. By the end of the year, he cooked lasagna for 60 of his new friends. As planned, Jain did research with Denn, building mathematical models of pollution control in the Delaware River. Denn also encouraged Jain to travel to New York City and see the Museum of Modern Art and Guggenheim, which fostered his enduring love of art. James Wei introduced Jain to the opera, inspiring a lifelong love for music. He would finish his master’s degree in two years, and could have earned his doctoral degree at an unusually fast pace with just another year or two of work on Denn’s project. But then, Jain got an opportunity for a new doctoral thesis project under the mentorship of Prof. Wei that would change his course—and the future of medicine. This approach was revolutionary, and Jain had an immediate question: Had anyone used this new model to study how cancer drugs infiltrate a tumor—or don’t? To be effective, the medicine needs to stay in the tumor long enough to kill it. No one had yet addressed this, so Jain did. When Jain took on the project, he didn’t know anything about cancer research. He locked himself in a room for a week and read a human physiology textbook cover to cover. It paid off. In his doctoral thesis, he described how drugs flow into and out of solid tumors. “If you are too comfortable, that means you are not pushing the boundaries,” he says. After graduating from UD, Jain was a faculty member at Columbia University and then at Carnegie Mellon University. In 1983, he visited UD to deliver the Allan P. Colburn Memorial Lecture, a talk by a distinguished early-career chemical engineer. Chakraborty, then a first-year graduate student, was in the audience. “That’s when I first heard him give a talk, and I was extraordinarily impressed,” says Chakraborty. Their formal introduction would come later. Jain would leave Carnegie Mellon for Harvard Medical School and Massachusetts General Hospital (MGH), where he has conducted basic research since 1991. Although he doesn’t interact with patients—he’s not a medical doctor—he hears stories from surgeons who’ve felt rock-hard tumors soften to spongy masses thanks to one of his pioneering therapies. He attributes his success to hundreds of collaborators all over the world, and to more than 200 exceptional graduate students and post-docs. Chakraborty did indeed work with Bischoff, who co-advised him along with the late Gianni Astarita. Like Jain, Chakraborty forged a path that had not yet been cleared, or even stepped upon. He did research that represented a new interface of disciplines, bringing quantum mechanical theory to chemical engineering problems. It was a risky move. “He asked me: ‘Well, do you think that it’s a good direction to go in?’ I told him I did. ‘Well then,’ he said, ‘you should do it,’” Chakraborty recalls. Pigford gave Chakraborty a copy of a groundbreaking, rule-defying book he had published in 1947 as a graduation gift: The Application of Differential Equations to Chemical Engineering Problems. The volume, now with a weathered cover, sits on a shelf in Chakraborty’s office at MIT. Chakraborty forged ahead. He worked hard but had fun, too. He and his classmates enjoyed beer and onion rings at the Deer Park every Friday. They ate at the now-shuttered Roy Rogers on Main Street—and at the “upscale place,” Klondike Kate’s. He also introduced some friends to Indian food in Philadelphia (at the time, there were no such restaurants in Newark). An avid tennis player in his youth, Chakraborty picked up racquetball at UD, playing against students and faculty members. When he returned to campus in 1993 to give the Colburn lecture (the same distinguished seminar Jain gave 10 years before), he challenged the undefeated Prof. Michael Paulaitis and won. After graduation, Chakraborty joined the faculty at the University of California-Berkeley, where his faculty mentor was none other than Mort Denn, the man who had inspired Jain to attend UD nearly two decades earlier. A few years later, when Jain visited UC-Berkeley for a seminar, Denn and his wife invited Jain and Chakraborty to dinner. It was the first time the two Blue Hens would meet. That was nearly two decades ago. Some years later, while still at UC-Berkeley, Chakraborty read a paper on the immune system that made him curious in a way he hadn’t felt in a long time. He decided to explore the concepts in the paper further—a pivot from his earlier research. Chakraborty left Berkeley in 2005 and joined MIT’s faculty. Since 2009, he and his colleagues at MIT have been working on rational design of vaccines against highly mutable pathogens, especially HIV. Chakraborty doesn’t regret his path to immunological research. In fact, he thinks of it as one of the most significant and satisfying things he has done—a success he attributes to his curiosity.